Maxar Technologies investor day presentation. Credit: Maxar. 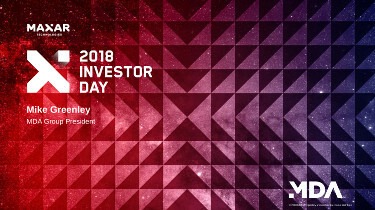 Maxar recently held its 2018 investor days. The purpose? Sell institutional investors on why the company now known as Maxar Technologies, formed from MDA, SSL, Digitalglobe and Radiant, is a company going places. The message, institutional investors should have a larger Maxar position in their portfolios and they should market the company to their clients. For Canadians, one of the questions has been, is a larger Maxar good for Canada? That depends on who you talk to. Ask a politician and depending on which party they represent, what riding they are in, if they are part of the government, and you’ll get many different answers, both pro and con. From an investors perspective, you are looking at the return on your investment. And it is important to note that Maxar is a public company, not a private company, not a government crown corporation or agency. While It must follow the law of the land, including security exchange rules, it is also responsible to its shareholders. Understanding that perspective is important, and directly relates to why the company chose to expand beyond the limited market that is available in Canada. It is also important to understand the market segment Maxar belongs to. 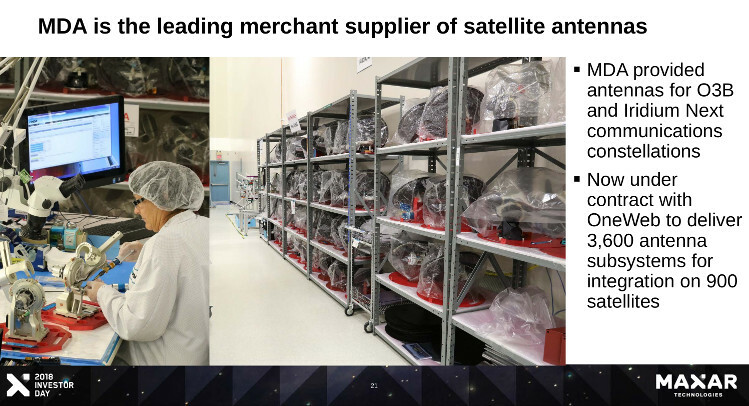 Because it is a space company with defence implications, it was in a tough position when it was just MDA, the Canadian company, as it tried to access its largest available market, the United States. Factor in the company was public, mindful of shareholder value, a limited Canadian market, and the U.S. access strategy makes sense. While there have been detractors of this strategy, none has suggested an alternate model that would have seen the company grow and provide expected shareholder return. Looking at a stock chart since the day after MDA completed the acquisition of Digitalglobe on October 2, 2017 we see that the stock has had a bit of a wild ride. First it climbed 12.25% up until Maxar announced its Q4 and year end 2017 results on February 22. Then it took a dive. Overall since the acquisition closed, the stock is down 12.69% as of the closing of markets yesterday. Maxar held an investor day in Toronto on March 6, and in New York on March 8. The New York presentation also included an audio visual presentation which you can still listen to and watch. The 143 page slide presentation is available below and you can also download it. The MDA portion of the presentation starts at slide 38. The presentation is comprehensive. It will take you four hours to listen to the commentary with the slides. There’s no doubt the push is on to convince institutional investors on the value of Maxar. This is not the same Canadian MDA company of a few years ago. But MDA remains an integral part of the larger picture.